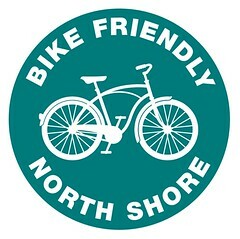 From March 2010 to August 2016 Bike Friendly North Shore promoted and celebrated bicycle culture on Auckland’s North Shore. In those six and a half years Auckland’s cycling landscape changed considerably. As I write this it looks like you might be able to ride over that pesky bridge above (in the not-too-distant future) without getting arrested, times are certainly changing! There’s still a long way to go before cycling is accepted as a “normal” transport-option in the city of sails, but despite being a natural pessimist I’m full of hope for our two-wheeled future. Blogs like this were a great way to connect with like-minded people, but social media has taken over that role, so I’m hanging up my mouse and getting outside to ride my bike instead. Thanks for your support over the years, and if you see that lanky freak in the photo above riding around town, pull up alongside and say hello! Our logo was inspired by the Bike Friendly folks of Texas, and used with permission. Welcome North Shore! We wish you the best of luck, and can’t wait to visit and see your successes! Your friends at Bike Friendly Knox-Henderson (Dallas). Great Work on this site, happy riding the NS. Thanks guys. Bike-Culture (at least the type you are enjoying) is pretty thin on the ground down here, but I’m sure there are others out there on the North Shore with a similar outlook on cycling and the Bike Friendly concept just might bring them together. Roselle is a local that contacted me to wish me well and I hadn’t told a soul about the blog, so that was an encouraging start. Great idea and great looking blog. I’ll be sure to blog about it soon too….. Thanks Paul, I’m slowly getting my head around WordPress. I need to find some locals to help me with the “bike friendly” concept if it’s going to grow. I’m not convinced there’s any “bike-culture” around here yet, but it’s early days! Awesome site!! Wow. This is an important initiative for bike power on the Shore. Well done, bikers. Thanks Bronwen, I struggle a bit with the writing side of things but am doing my best. Thanks for a great resource. Bought new bikes today for me and the seven year old and our first ride was Orewa, Te Ara Tahuna.. it was a lovely ride and great for us both to be away from the screen! Cool, must get up to Orewa again with the kids when it stops raining! I haven’t got the time to keep the blog updated any more but I suppose it’s still a bit of a “resource”, there’s not much else out there. Hi Antoine, good initiative to start this blog. I’ve only recently arrived in NZ (June 2012) and bought myself a bike straight away. Am using it every day to cycle to work, do shopping, etc. Anyway, we can only hope things will improve. 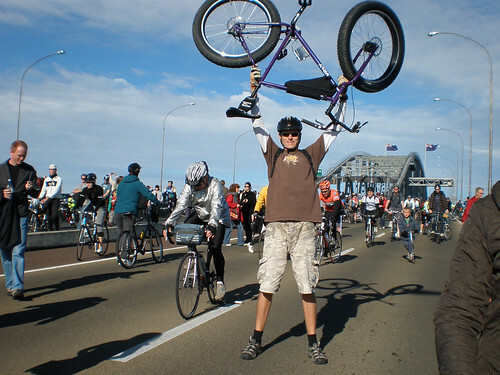 I’ve joined Cycle Action Auckland as well and like their relentless push for a better cycle infrastructure in Auckland, “City of Cars” – http://www.youtube.com/watch?v=sCKDBHT3i74. Hi Jos, thanks for the kind words. Enjoy your first Auckland summer on two wheels (longer than the 3-weeks you are used to back in Holland ;^) and don’t forget your jousting pole for our local traffic conditions! Is there any chance to get some stickers from you?